Not sure what the next step on your path is? Let our staff help you along the way. What is a Learner Mentor? Who is my Learner Mentor? Dual Enrollment Students: Contact Stacey Sokol, RBC Program Manager, at ssokol@rbc.edu for the name of your learner mentor. When do I need to meet with my Learner Mentor? Typically you will meet with your Learner Mentor at the beginning of every semester, you will also want to check in with them throughout the semester, or whenever you have questions, concerns, need help with study habits . . . the list goes on and on! Your Learner Mentor is your resource for success. Use their knowledge! They’re there just for you! How do I declare my degree? Use the college catalog to better understand the different degree options and their requirements. Choose which degree you want. Use the college catalog or your degree evaluation on banner to plan out which courses you’ll take to fulfill your degree and remaining curriculum requirements. Complete the form by clicking here to formally declare your degree. You will receive an email confirmation once your degree has been successfully changed. This process is only done once a week. Meet with your Learner Mentor to go over the requirements of your degree together. You are responsible for understanding and meeting the requirements of your degree. The Associate in Arts Degree is designed primarily for those students who plan to complete their baccalaureate degrees in areas of the arts, humanities, or the behavioral and social sciences. There are fewer math and science course requirements to meet this degree. The Associate in Science Degree is designed primarily for those students who plan to complete their baccalaureate degrees in areas of education, business, health professions, social work, engineering, or one of the natural sciences. There is no foreign language requirement to earn this degree. The Liberal Arts Certificate (31 cr.) is designed to document students’ progress towards the A.A. or A.S. degrees. 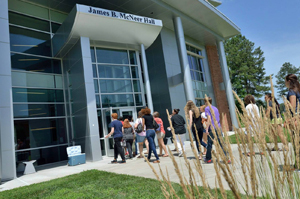 After two semesters of coursework, students will have a solid grounding in the liberal arts and will be prepared for their sophomore year, either at Richard Bland College or elsewhere. How do I schedule an appointment with my Learner Mentor? To schedule an appointment with your Learner Mentor you can use the calendar feature on canvas. Write down your appointment or save it in your phone as a reminder. What if I don’t have a major? Learn How to Become Learn How to Become is an online career site to assist you in educational and career exploration. It will help you to think about what motivates you, your work-related values, interests, personality and skills to find possible educational and career paths. If you have any questions, please contact Student Success, at (804) 862-6100, ext. 8570 or via email.